"They're going to have runny noses, they're going to have some skin rash," Conley said. "People who are in a small, contained environment for hundreds of days — that happens to them." Astronauts should assiduously track the nature and severity of these various illnesses as part of their concerted health-monitoring efforts, she added, with one crewmember assuming primary responsibility for implementing planetary protection protocols throughout the entire mission. 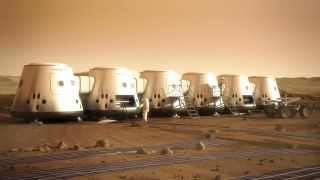 NASA's working plan also calls for quarantine capabilities and appropriate medical testing to be provided to crews returning from Mars — and for everyone associated with any manned Red Planet mission to keep things in the proper perspective. "Six people going on a mission to Mars — if something happens to them, that's a really bad tragedy and we want to prevent that as much as possible," Conley said. "But six people bringing some horribly infectious, horribly damaging organisms back from Mars to Earth is a global tragedy, and there is a difference in scale there that has to be recognized."